It's summer, and I want delicious and easy recipes for all my meals. No complicated preparations, just quick and simple. Because when fresh produce is in season the last thing I want to do is muck up the taste with heavy sauces or overcooking. This corn on the cob dish is a perfect example. Barely cooked corn (or grilled), topped with the freshest possible basil pesto, sprinkled with tangy shredded Parmigiano-Reggiano cheese. How good does that sound? And, to give it a bit of a kick, I added jalapeño peppers to the pesto. I will be serving this all summer. Enjoy! Roast or grill corn. Or, bring a large pot of water to a boil. Salt water and add corn. Boil for 2 minutes. Remove from cooking water and place on a platter. 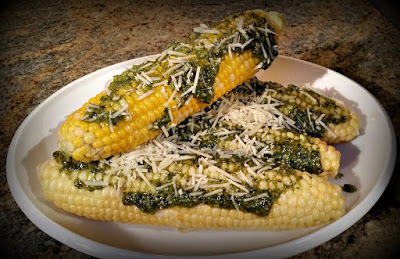 Spread pesto liberally over each ear of corn. Top with Parmigiano-Reggiano. Pass the salt and pepper to season as desired. Serve immediately. Toast pine nuts in a skillet until just beginning to brown. Remove from heat and allow to cool. Add cheese to a food processor fitted with the chopping/mixing blade. Process until the cheese is grated. 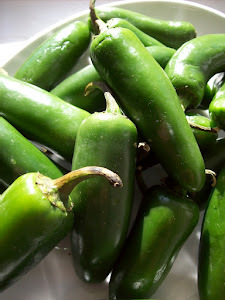 Add cooled pine nuts, garlic and jalapeno pepper and process until all ingredients are finely grated. Add half of basil leaves, and 1/4 cup olive oil and process until smooth but with a bit of texture. Add remaining basil, remaining olive oil, 1/4 tsp salt and 1/4 tsp pepper. Process until well mixed. Taste and adjust seasonings if desired. 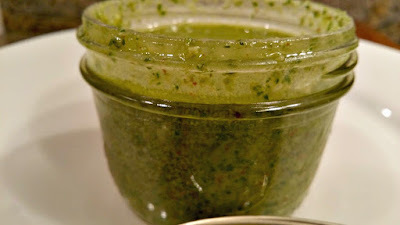 Other Pesto recipes you may enjoy. Summer means easy, breezy dishes made from fresh, just-picked produce and this week at Food Network's Summer Soiree we are celebrating Pesto. Do you have a favorite pesto recipe? 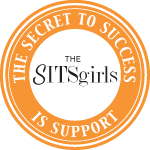 And be sure to check out the delicious sounding recipes from my blogger friends and Food Network.